James Turrell is widely acknowledged as one of the most important artists working today. From the mid 1960s onwards his principal concern has been the way we apprehend light and space. His study of mathematics and perceptual psychology, as well as his Quaker upbringing and background as a pilot, inform his practice. His first exhibition in 1967 of ‘projection pieces' used high-intensity light projectors to give the illusion of a solid geometrical object, often seemingly floating in space. From these investigations of light, Turrell went on to begin his series of ‘Skyspaces'. These are enclosed viewing chambers that affect our perception of the sky. Since then he has continued to create works using light as his medium. Perhaps his most celebrated works are his ‘Ganzfeld' chambers, whole spaces immersed in light; as well as his more recent ‘Tall Glass' series, which resemble windows of slowly changing colour. Meanwhile, Turrell continues work on a monumental project at Roden Crater, an extinct volcano in Arizona. Here he has created a series of viewing chambers, tunnels and apertures to heighten our sense of the heavens and earth in one of the most ambitious artistic endeavours of modern times. 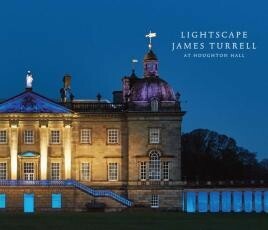 In summer/autumn 2015, Houghton Hall, Norfolk, hosted an ambitious and significant exhibition of James Turrell's light pieces, many collected by the Marquess of Cholmondeley, owner of Houghton, who has long been an admirer of his work. This publication has been produced to document and to accompany the exhibition - a project devoted to James Turrell's work has been a long-held ambition of Lord Cholmondeley. He first discovered Turrell's work twenty years ago, and in 2000 invited him to Houghton to install a ‘Skyspace' amongst the trees on the west side of the house. Soon afterwards, a rusty water tank was removed from an eighteenth-century folly in the park to make way for his atmospheric interior space, ‘St Elmo's Breath'. The exhibition was centred around works from the Houghton collection, which also includes projections, a ‘Tall Glass', holograms and prints. The exhibition was complemented by further loans to help illustrate the broad spectrum of Turrell's work; and a unique, site-specific installation was created especially for Houghton - ‘The Illumination'- lighting the whole west façade of the house that could be viewed from dusk. LightScape follows three highly acclaimed exhibitions by Turrell in 2013/14 at the Guggenheim, New York, the Los Angeles County Museum of Art and the Museum of Fine Arts, Houston. The National Museum of Australia, Canberra has also hosted a major retrospective of his work which closed just as the exhibition at Houghton Hall opened. The publication includes a foreword by David Cholmondeley, a text by Peter Murray, and an interview with the artist by Hiram C. Butler. Designed by Peter B. Willberg and printed in Italy, this hardback, cloth-covered publication is essential reading for all admirers of Turrell's oeuvre.